Los Angeles-based Umami Burger is expanding across the country, including Las Vegas. Adam Fleischman's gourmet burger concept has made a name for itself with signatures like the Umami Burger made with umami ketchup, roasted tomato, shiitake mushrooms, caramelized onions and a Parmesan crisp. For more information, visit www.umami.com. Joe Vicari’s Andiamo Italian Steakhouse has opened at the newly renovated the D Las Vegas hotel in downtown Las Vegas. This eatery is Vicari’s first outside the state of Michigan, and joins his other nine restaurant locations in Detroit. Menu items include the baseball-size Andiamo grande meatball, pappardelle with veal ragu, handmade tortelloni, Maine lobster, Scottish salmon and rack of lamb. The steaks are aged for 30 days and come in cuts of bone-in New York strip, porterhouse, filet mignon and a 32-ounce tomahawk rib eye. The steakhouse is open nightly from 5 p.m.-11 p.m. Joe Vicari’s Andiamo Italian Steakhouse, 301 E. Fremont St., Las Vegas, NV 89101, 702-388-2400. Internationally acclaimed chef Nobu Matsuhisa’s Nobu Restaurant Caesars Palace has opened alongside the world’s first Nobu Caesars Palace hotel. The restaurant is Matsuhisa’s first restaurant to open on the Vegas Strip, first to open alongside a Nobu Hotel, and his first to offer an in-room dining menu. The 11,200-square-foot restaurant, designed by David Rockwell and his firm Rockwell Group, includes design elements of bowed columns of bamboo, colorful private dining pods and oversized light fixtures. Nobu Restaurant accommodates 327 guests, with several teppanyaki tables, a sushi bar, a private dining area and a large lounge and bar. 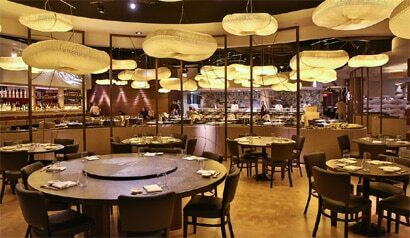 Nobu Restaurant Caesars Palace, 3570 Las Vegas Blvd. S., Las Vegas, NV 89109, 702-731-7110, 877-427-7243. Valentino at The Venetian is offering a hands-on Sommelier for a Day experience. Certified sommelier Gretchen Allen, the wine director at Valentino, leads guests in a one-on-one training session during which she guides them through the history of wine, all aspects of wine service, wine and food pairing, and an exploration of Valentino’s wine list of more than 2,400 selections. To finish off the evening, guests will be treated to a tasting of Valentino’s most elite wines paired with chef Luciano Pellegrini’s cuisine. The cost is $250. Call 702-414-3000, and ask for Gretchen Allen to make reservations. Valentino, The Venetian, 3355 Las Vegas Blvd. S., Las Vegas, NV 89109, 702-414-3000. Public House at Luxor Hotel & Casino will host Spring Break revelers with food and drink specials available through Sunday, March 31. Offers include $3 Coors Light and Bud Light drafts, half-priced signature cocktails and $5 bar bites, such as cheesesteak spring rolls, mac and cheese squares, short rib tacos, a hummus plate, and spinach and artichoke dip. The specials are available during opening hours from 11 a.m.-2 a.m. daily. Public House, Luxor Hotel & Casino, 3900 Las Vegas Blvd. S., Las Vegas, NV 89119, 702-262-4525; 800-288-1000. The Buffet at Bellagio has added a new station featuring traditional, ikura and tobiko caviars during dinner service on Fridays and Saturdays. The caviar may be served alone or atop house-made blinis, miniature buckwheat waffles, freshly rolled sushi and ahi tuna cones. This option is included in the "gourmet dinner" price of $37.99. The Buffet, Bellagio, 3600 Las Vegas Blvd. S., Las Vegas, NV 89109, 702-693-8111. John Church is the new executive chef at Rick Moonen’s RM Seafood at Mandalay Bay. Church is a veteran of the Las Vegas and Southern California dining scenes, having worked at Vegas restaurants Aureole, Alizé at the Top of the Palms, Andre’s Monte Carlo, Eiffel Tower, View Wine Bar & Kitchen and P.J. Clarke’s, and at XIV by Michael Mina in Los Angeles, and Root 246 by Bradley Ogden in Solvang. Church replaces Chris Starkus, who is moving out of state. RM Seafood, Mandalay Bay Resort & Casino, Mandalay Place, 3930 Las Vegas Blvd. S., Las Vegas, NV 89119, 702-632-9300. Chef Matthew Bosek has taken over as room chef at R Steak & Seafood at the Riviera Hotel & Casino. Bosek most recently served as culinary leader for Google in Kirkland, Washington, where he worked side-by-side with chef Jason Wilson. R Steak & Seafood, Riviera Hotel & Casino, 2901 Las Vegas Blvd. S., Las Vegas, NV 89109, 702-794-9233, 800-634-6753. Michael Mina’s Nobhill Tavern at the MGM Grand Hotel & Casino will close March 30th. The restaurant has been open for 12 years. Rumors have it Mina will not be involved in its replacement, as he is concentrating on his Pub 1842 concept at the MGM Grand, in the former space of the shuttered SeaBlue. Nobhill Tavern, MGM Grand Hotel & Casino, 3799 Las Vegas Blvd. S., Las Vegas, NV 89109, 702-891-7337. The Victoria Café and Drai’s Nightclub at Bill’s Gamblin’ Hall & Saloon closed on February 4 to accommodate a major renovation that will convert the property to a boutique hotel and casino. It is expected to open in early 2014 under a new name. Victoria Café, Bill's Gamblin' Hall & Saloon, 3595 Las Vegas Blvd. S., Las Vegas, NV 89109, no phone.